"Perfect Weather and a Great Course"
I love Grandma's Marathon. 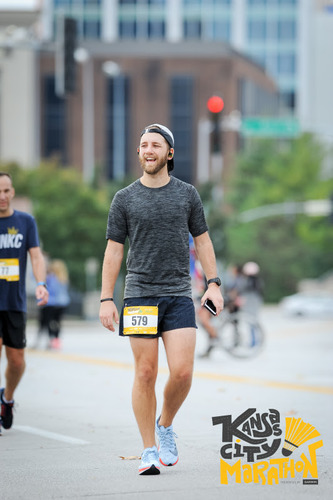 This was my 4th Grandma's and my 20th Marathon overall. 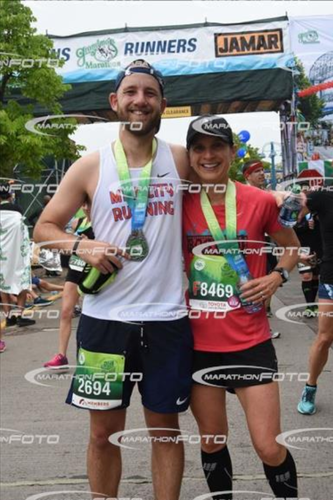 After the last two years of hot and humid weather it was awesome to have some good weather (foggy and cool for most of the race) - unfortunately I was really struggling with plantar fasciitis and had not been able to train appropriately for seeking a PR. Course: Rolling hills. Beautiful views of Lake Superior (at least when the fog clears up enough that you can see the lake. Last 6 miles are run through Duluth. One change for this year's race was the path downtown - Superior Street was ripped up so they had us run down one block over which had spectators a little more restricted. Lodging: First time staying in the dorms. It was actually a really nice set up - we had a 4 person apartment and far far cheaper than staying in a hotel in Duluth. Food / Drink: Hoops Brewing and Fitgers Brewery for dinner. Gear: The shirt was a little disappointing this year - weird texture. Medal is good though - heavy. Overall: One other thing I'd feel terrible about if I didn't mention - the city of Duluth goes all out for this race and it is an awesome community. Good food, better beer, and really wonderful people. I'm still not sure how to judge this race - there are parts of it that are really cool and others that were disappointing. When I think about picking one race in each state to run towards my goal of 50 states I'm not sure that I would pick the Asheville Marathon again. I don't have experience with other races in North Carolina but I'm not convinced it was the right race for me and my family. Course: The course winds all throughout the Biltmore estate. The first 10 miles or so are very hilly and on asphalt; after that you get a variety of surfaces beneath you - crushed rock, wide dirt path, asphalt, and utility roads in the winery section. The last of these were particularly problematic for me - the rocks were uncomfortable and unstable to run on and it was a rather hilly section of the race - all around just not great for my plantar issues. Lodging: We stayed in Asheville in a small hotel. Good set up overall because the race was at the Biltmore and we were more interested in what the city had to offer it worked well for us. Also much cheaper. Food / Drink: We ate and drank real well in Asheville. Biscuit Head was awesome brunch and Buxton Hall BBQ was an amazing experience. We asked the waitress to surprise us and the food was really really good. As for the beer - Burial Beer Co and Catawba were our favorites. Gear: The shirt is pretty standard. The medal is a stamped piece of wood and they also gave out fleece blankets. Pretty good overall. 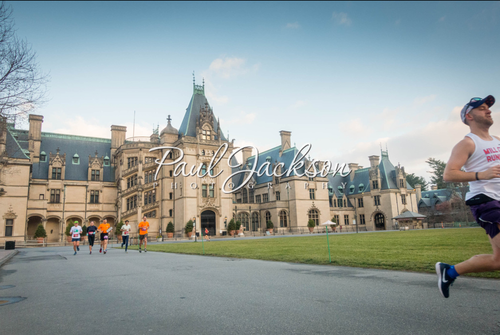 Other Notes: A previous reviewer mentioned that this is a Biltmore Marathon rather than an Asheville Marathon - that is 100% correct. Asheville is a really cool town and one I would go back to again. The Biltmore is beautiful and really interesting - made better because we spent the $60 admission fee to tour the home the day after the race. The expo is small but easy to get in and out of. You have to buy a pass ($20 each) for spectators to be able to watch the race and even at that point they are only allows to spectate from 2-3 points on the course. Overall: It's a nice race but it's kind of absurd that spectators have to pay to get access to the course and you better enjoy out and backs. Truth in Advertising: I might be biased - I have a tattoo of the Twin Cities Marathon logo on my leg. It remains bar none my favorite race in the country. It's not the easiest. It's not the biggest. It isn't the perfect weather. But it is the best marathon in my opinion. I didn't grow up in the Twin Cities but Minneapolis has been my home since 2009 and I hope it will be for the long haul. Parking around the expo is a pain but it is a big expo and a lot of fun. Race day is a breeze. The course is beautiful. Pretty flat early, rolling hills in the middle, bigger hills from 18-24, more or less downhill the rest of the way. It is almost always a beautiful weekend in Minneapolis and Saint Paul. Some years are warmer or colder than other but the median temperature is pretty good. All in all - it's just the best. Can't recommend it enough. "Lot of Fun and Hills"
My last long run of training was -30 degrees; the weather in Austin was 65 degrees. Quite the change. Otherwise, Austin was a really fun experience - course is tough but we saw most of the city and it was an all around great time. Course: The course takes you all around the city - there are a few boring sections along the railroad tracks but otherwise it's a good course. Lot of hills - rolling (and occasional big hills) for the first 20 miles or so. Then as a special form of torture the Mile 26 marker sits on top of a very steep hill which you promptly run back down on dead legs to the finish. Lodging: We rented an AirBnB downtown. Worked out awesome. Food / Drink: All the breakfast tacos. I love breakfast tacos so much. We went to Bufalina for our pre-race dinner and had a fantastic experience. Mean Eyed Cat had really good BBQ and we had a lot of fun at the White Horse the night after the race. Gear: The shirt is pretty standard but it looks good. The medal is awesome. Still one of my favorites. Overall: Just so many hills. Austin is really fun though and it was a great getaway from the winter in Minnesota.